Art and design define our lives for us, teach us how to function in the world, and, from time to time, produce an object, whether human or inanimate, that is so fulfilling that it become unnecessary to alter the blueprint. Since the 1920s, short skirts for women have been as timeless as the trebuchet or siege engine. We may make art but we are made by design. An apparently simple object such as a bow and arrow, took centuries to prefect as countless nameless designers searched for a shape that would be both efficient and effective. In response to the new weapon, the human body had to be trained to move reacting to the demands of bending the bow and the needs of the taut string that needed to be pulled away from the bow and stretched for the length of the archer’s arm. Thus the body in turn had to be redesigned: one arm had to be held out, stiff and still and unmoving, the hand gripping the bow. 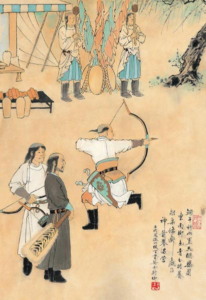 The other hand had to grip the thin string, strain its flexibility by drawing the twine towards the face of the archer who must also somehow balance an arrow on his bow hand and pull the shaft back with the string. And the length of the arrow and the length of the string must be perfectly calculated to the body of the archer. The bow and arrow was so necessary to human survival that most cultures around the world invented this hunting weapon and all cultures came to the same conclusions, creating a universally satisfying way of sending a shaft fast and hard through the air and into the body of an animal. But excellent design does not suddenly manifest itself. Design is a time based process and designers can take years or even generations to work their way towards a final design that would be truly satisfying and seemingly inevitable. We cannot calculate how many generations it took to perfect the bow and arrow but we can be sure that evolving knowledge was passed from maker to maker until the ages of experimentation, trial and error were over and the age of perfecting the weapon began. “Good design is as little design as possible,” said a young German designer. One of the most important designers of the late twentieth century, Dieter Rams (1932-), is best know for his distinctive signature Braun products. He also considered the “unspectacular” elements of design to be the most important. In other words, Rams was advocating a design stripped down, shorn of all non-essentials.If the design evolves towards this kind of satisfaction, it is a design that will last. “I always strive for things to be sustainable. By that I mean, the development of long-lasting products–products that don’t age prematurely, which won’t become out of style. Products that remain neutral, that you can live with longer,” he explained. In the 1960s, when he was quite young, Rams, a visionary, pushed design out of the twentieth century and into the twenty-first century, making this important step forward by looking back several decades to the Bauhaus of the 1920s. What Rams took from the Bauhaus was the clean simple shapes, stripped down to the essence of their forms. His 1958 design for a transistor radio, a new invention, was a masterful understatement of basic geometry. 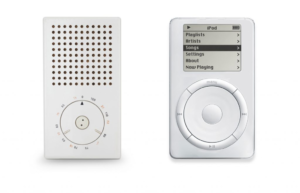 But the Dieter Rams idea for the transistor radio design did not originate with him, the iconic design began in Texas via Holland. The inventor of the transistor radio was Dr. Heinz De Koster who was born in Germany and educated in the Netherlands during the Second World War. Little is written of him other than the fact that he was the inventor of the transistor radio, in terms of technology. But the transistor itself was an invention of what Winston Churchill called the “Wizard War” and its technologies, such as radar which led to the invention of the transistor in 1947. The engineers at Bell Labs in New Jersey, John Bardeen, Walter Brattain and William Shockly were awarded the Nobel Prize in Physics in 1956. According to Cari Romm writing for the Smithsonian Magazine, reported that in 1951, “..two companies teamed up to begin researching a new idea: a small, portable radio. Texas Instruments supplied the transistors to Idea Inc., who designed, produced, and—three years later—finally debuted the Regency TR-1 in November 1954, just in time for the holiday-shopping season.” As can be seen, the first transistor radio was bright and glittering, its strong colors hiding its technology, holding its own modernity at bay. 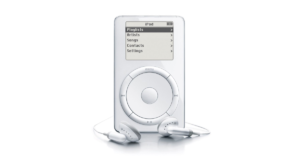 Small and portable, it allowed the new consumer group, the teenagers, to listen to their music, rock ‘n’ roll, in privacy safe from the scorn of their parents. Although the Regency TR-1 was the beginning of a revolution in music, it did not look the part. 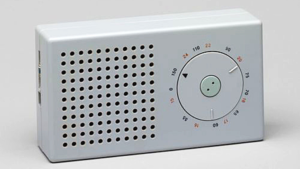 Making the modern radio modern was the task of Dieter Rams. 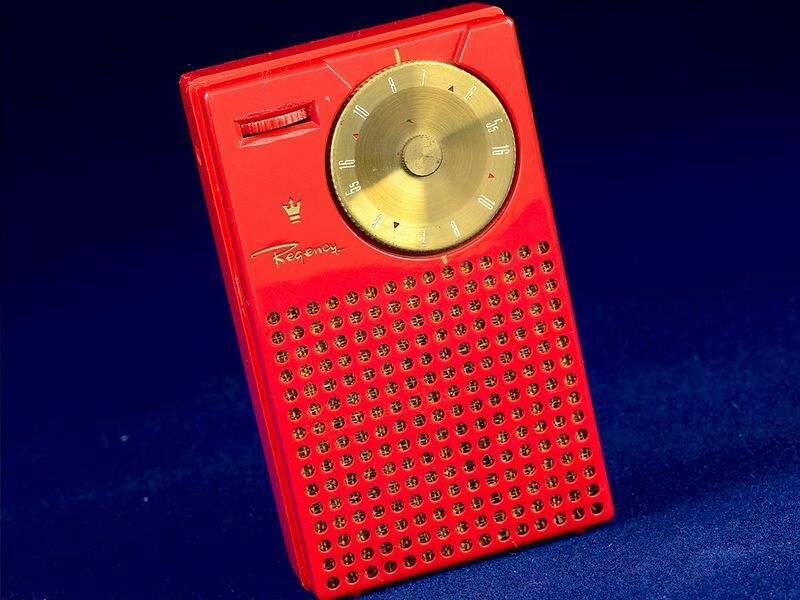 Four years later, Rams presented his own design for a transistor radio, eliminating color completely, stressing the design fact that the color of modernity had always been white. As the main designer for Braun Company, founded in the early 1920s, Rams was part of an organization that had been founded on a novel combination of a radio and photography designed by Max Braun in 1929. Braun’s radios also had the novelty of a built in speaker, putting his products on the cutting edge of communication and the quality of sound. After the Second World War, the Braun heir, Artur Braun worked with Fritz Eichler to design a tiny tabletop radio, called the SK 1. The speaker covered with fabric was now a grid of perforations surrounding a dial and two unmarked dials. The entire 1955 model was white. In 1956, Braun teamed with the Ulm Academy of Design for a new radio face for the Exporter 2 and replaced the perforations with open slots arranged as horizontal rows. As Rams said, “Indifference towards people and the reality in which they live is actually the one and only cardinal sin in design.” His T 3 brought back the less intrusive perforations and used only one dial, the ultimate simplification and minimalism for the working radio. The Rams radio was the size of a pack of cigarettes and could be conveniently placed in a man’s shirt pocket or in a woman’s purse. The designs Rams did for Braun during the late 1950s and 1960s were consistent in the aesthetic, regardless of the object itself. 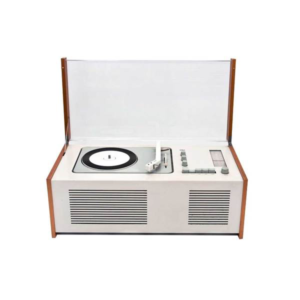 Based on a circle and a square and the color white, the Rams radio is the cousin of the Rams electric razor and is the brother of the larger table model radio which is in turn related to the radio-stereo combination, the SK 4 radiogram of 1956. The box of the machine acts like a speaker and Rams used the slits in the front of the stereo as design elements: one set for the turntable and one for the radio. The rectangular white RT 20 radio is trimmed with simulated wood and its front is a circle off set by an L of control buttons and the vertical strip where the stations were located. Over and over, the circle and square or rectangle, curves versus straight lines, are repeated and become a recognizable ethos for modern post-war design. Rams is famous for saying, “weniger aber besser,” or “less is better.” His apparently simple designs are no so simple, they are in fact the result of complex thinking and eliminating all but the most necessary elements for the user. To come to a holistic simplicity, Rams had to think in terms of even the smallest factor. As he said, “My heart belongs to the details. I actually always found them to be more important than the big picture. Nothing works without details. They are everything, the baseline of quality.” After designing for twenty years, Rams published his famous Ten Principles, which are as simple and as straightforward as his designs and as timeless as his products. “I didn’t intend these 10 points to be set in stone forever. They were actually meant to mutate with time and to change. But apparently things have not changed greatly in the past 50 years. So even nowadays, they are still accepted,” he said, and, in fact, these Principles are often referred to as the Ten Commandments. One of his principles states in the words of Rams: “Good design emphasizes the usefulness of a product whilst disregarding anything that could possibly detract from it.” “Only well-executed objects can be beautiful,” he asserted, maintaining that good design is aesthetic, meaning that the design which is well executed is also its intrinsic purpose. To express that purpose, a good design has to be unobtrusive, rejecting decoration and deliberate artfulness. “Their design should therefore be both neutral and restrained, to leave room for the user’s self-expression,” Rams noted. When he said that design is “self-explanatory,” one immediately remembers that, as Rams explained, good design is timeless and honest. Therefore, it can be said, that design evolves but also advances, changing how we live, work, think and move. In a fast-moving contemporary world, design changes take decades and not centuries, but at a certain point the pattern is paused. A satisfaction point has been reached. This cessation takes place when the design seems “inevitable.” The potato chip chair of Charles and Ray Eames is, in its own fashion, perfect. 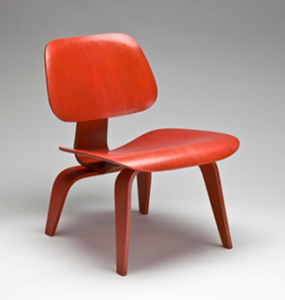 This chair which has a rather more formal name, LCW (Low Chair Wood), was designed by the famous designer couple in 1946. The LCW has a simple curved seat set on simple arched legs, straddled wide for a supportive stance. The comfortable tilt back of the set delivers the sitter into the embracing back. Both scooped segments are plain bent plywood, an innovation perfected by the famous design couple. The two “chips” are the essence of “chair,” you sit and you lean back, you are supported and you are comfortable, you are satisfied with the bare but well crafted, thoughtfully designed and ergonomically considered, essential chair. There was no need to develop this piece of furniture further. Psychology is important to design; the designer and consumer reach that point together, a place where aesthetics and function and form merge and a universal configuration is achieved and a certain visual peace descends. At least until the next designer thinks of something entirely new. Today we live in a world created by new forms made during the opening years of twentieth century, when art and design were tasked with creating unprecedented objects for an unprecedented epoch. Many of these designs are still with us to this day. So, the question is when did the “modern” begin? Designed by Charles and Ray Eames in 1945-46, the LCW was awarded the distinction, “Best Design of the Century” in 1999 by Time Magazine. This series starts with the modern event that ended the long and lingering nineteenth century and initiated the twentieth century. The Great War of 1914 to 1918 changed the landscape of Europe and the mindset of all those who participated in it, from England to Germany to Russia to Turkey to America. Out of this war came, not just new ways of thinking about technology but also iconic new objects that demanded new designs, such as the first mobile phone. In other words, the Great War, as it was known at the time, was a line drawn in the sand; there was no going back to the old ways and the only path forward was to remake and redesign what was clearly a new world. The next twenty years were decades in which designers gave society its modern appearance, from clothing to kitchens to furniture—little was left unchanged. This surge of innovation was ended by the Second World War. The Interregnum was over, the Modern was defined by 1940 but the War would interrupt the further development of modernity and that year is when this series reaches its end-point.